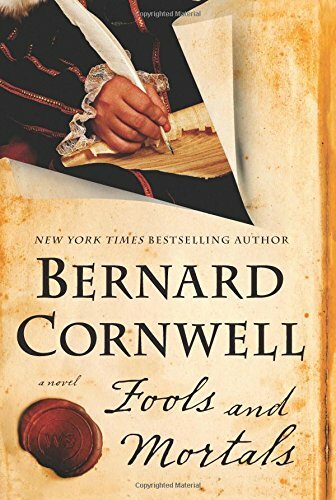 Perhaps the three words hardly seem to describe a Bernard Cornwell book, but really they do, particularly for Fools and Mortals. Imagine you are with a group of folks when you notice two men and two women together in a room. At first there is nothing out of the ordinary about the four save that both women are beautiful—one is much older than the other. Then the younger woman mocks the older one. You see the blood and lots of it flowing from her wound, staining her dress, and spreading across the floor. You and those around you gasp, too. WOW! Certainly sounds like a dramatic ending to an interesting book. Right? Well, not exactly, as those events did not occur at the end, rather they occurred toward the beginning. The only way to find out how close to the beginning is to read this intriguing, interesting, and informative tale. You might also be inclined to learn what the actual ending is like. Amid those events just described the tale at times seems to move rather slowly. This, however, should not deter you from reading and it should not be taken as a negative comment; for the number of characters are many and the author needed to slow things down a bit so they could all be developed sufficiently for the drama to reach its pitch; for when it does you will be on the edge of your seat and will not be able to put the book down! In typical Cornwell fashion there are twists and turns that sometimes result in one saying to themselves “How did we get here?” “Why this diversion?” “How do these events fit in?” The author slowly peels back the onion, and as he does everything makes sense. There is plenty of scheming going on throughout the narrative to keep the most dedicated mystery fanatic entertained and guessing. As noted at the beginning of this review “informative” was the third aspect of this novel. Thus the setting is quite important. A good author could hit the highlights of this tale in different setting and time period. But to provide the reader with interesting information about this period in history requires this particular setting. The narrative involves the brothers Shakespeare—William and Richard—and takes place sometime during the late 1590s well before the building of the Globe Theater on the Southside of the river Thames. Although Queen Elizabeth I had been on her throne for almost 40 years, the memory of Mary, Queen of Scots (beheaded in 1587) and the numerous conspiracies, both imagined and real, add an interesting subplot to the main narrative. Additionally, the author uses this time period to acquaint us with many of the cultural and social issues of the time: the disparity of wealth and social status. It is one thing to be exposed to the issues Cornwell raises here in history books; it is an entirely different matter when one reads about them in a novel where characters play real life parts that strike one’s imagination. In short, Fools and Mortals is a wonderful story written by one of the foremost authors of our time. The reader can easily imagine themselves watching the story unfold before their very eyes. Few authors can accomplish this as well as this author does. Cornwell never ceases to amaze. Interesting, intriguing, and informative, Fools and Mortals is highly recommended.